This is a comprehensive unit on the works of Edgar Allan Poe. This unit is especially designed for those who would like to do more--much more--with Poe than the literature book's paltry offering would allow. --The "Tales" folder includes "The Black Cat," "The Cask of Amontillado," "Eleonora," "Hop Frog," "The Imp of the Perverse," "Morella," "The Oval Portrait," and "The Tell-Tale Heart"; an overview of some of the major themes found in these tales; a test, matching passages to titles; and answers to the test. 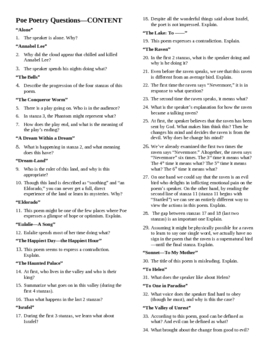 --The "Poems" folder contains the texts of 18 poems; 32 short-answer questions based on the content of Poe's poems, with answers; 27 short-answer questions based on the form of Poe's poems, with answers; 12 short-answer questions based on poetic devices found in Poe's poems, with answers; a 40-question multiple-choice test covering the poems; answers to the test; and two writing assignments. --The "Critical Essays" folder contains the texts of two of Poe's critical essays: "The Philosophy of Composition" and "Twice-Told Tales: A Review"; and five multiple-choice questions based on the two critical essays, with answers. --The "Poe Essay" folder contains an essay assignment based on recurring themes found in Poe and a rubric to accompany the essay.